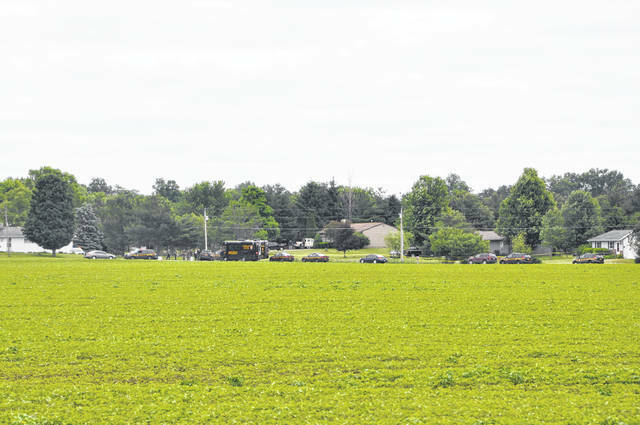 Delaware County Sheriff’s Office vehicles line the 11000 block of Kilbourne Road Wednesday afternoon. The sheriff’s office reports it was dispatched to the home because a resident, Brian Puskas, had been acting erratic and violent. Deputies arrived and found Puskas was armed and attempted to negotiate with him. The sheriff’s office reports deputies later shot Puskas, who was taken to a local hospital where he later died. A Kingston Township man was shot and killed just before noon on Wednesday after a domestic situation escalated into an armed standoff with Delaware County Sheriff’s deputies on Kilbourne Road. The Delaware County Sheriff’s Office reports that at 11:15 a.m. on Wednesday, a 911 call came in from Kingston Township resident Deanna Puskas, who said her husband, 47-year-old Brian Puskas, had come home from work and was acting erratically, tearing up the house and threatening her. The sheriff’s office reports that deputies arrived at the Puskas home at 11:25 a.m. where they found Brian Puskas in his yard, armed and acting erratically. The sheriff’s office reports deputies on scene negotiated with him for several minutes in front of his residence, but they were unsuccessful in their attempts to get him to comply with their orders. The sheriff’s office reported that Brian Puskas was shot by deputies, and the deputies immediately rendered first aid and called for medical assistance. Brian Puskas was transported to a local hospital, the sheriff’s office reported, where he later died from his wounds. The deputies involved in the shooting have been placed on paid administrative leave, per the sheriff’s office’s policy, and the Ohio Bureau of Criminal Investigation will be investigating the shooting, which is also according to the sheriff’s office’s policy. No sheriff’s deputies or police officers were harmed, the sheriff’s office reported. The Sunbury Police Department and Genoa Township Police Department also responded to the call, the sheriff’s office reported. The sheriff’s office also reports they have no records of any prior calls to the Puskas home.